The rate of improvement seems frankly unsustainable. 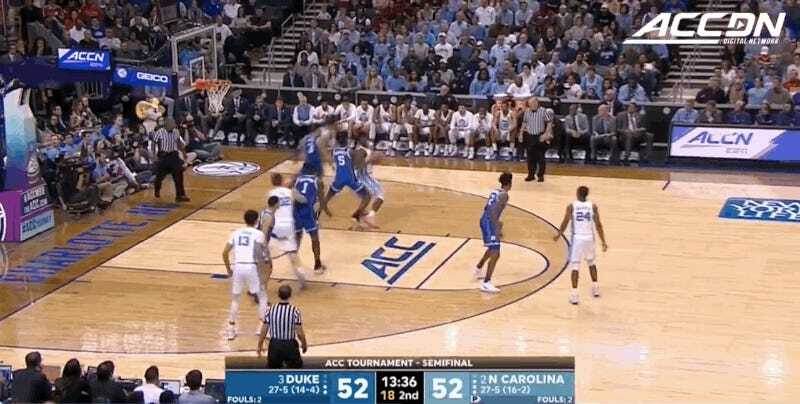 But Zion Williamson, who was once known for his comically improbable high school basketball highlight reels, is now cutting similarly ridiculous ones at the damn ACC Tournament. Can he just keep scaling up to new plateaus of competition? It’s hard to know at this point, but even the slight chance that he might—and might do so for your own NBA team—is enough to sap some of the sweetness out of the Mario Hezonja Game. Zion Williamson is worth losing 82 games. This isn’t even about the dunks. Zion’s offensive rebounding this weekend alone could fill its own reel: at 0:42, he’s completed two jumps and a full 360 degrees of rotation before anyone else on the floor has had a chance to do much more than their both arms straight up. By now his transition dunks precede him, but let’s at least note that at 5:56 he dunks the ball through the hoop and into his off arm with such force that it bounds skyward as forcefully as if it had struck asphalt. 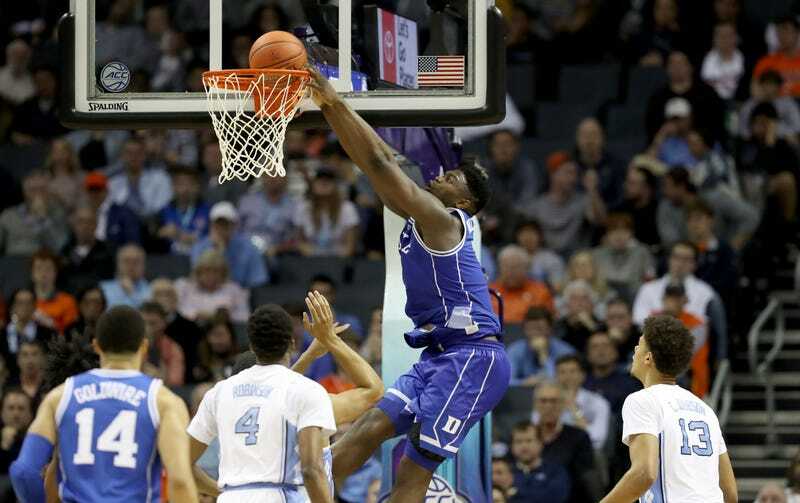 After three weeks of dormancy, against three of the nation’s better teams, Zion averaged 27 and 10, shooting 77 percent from the floor. Williamson’s typical shot attempts are, on paper, “layups,” which is accurate in the same way that Little Boy could be described as an “explosive device.” Technically, yes, Williamson sends the ball off the glass and into the hoop from very close range, but he does so with such severity, and with such simultaneous disregard for both any bodies in the vicinity and for the demands of gravity, that the word “layup” feels academic, quaint, inapplicable. These are just Zion Buckets. Somehow he’s always still on his way up while the ball is falling through the net. Why does he even jump the first time instead of just boxing out and waiting to collect the ricochet? Wrong question, who cares. Zion Williamson, at least, never needs to ask himself these questions. He just gets up there and stays up there, and he can afford a third, fourth, fifth leap if necessary. When you are that much bouncier than everyone around you, and than most other people ever to step on a basketball court, you are free to take whatever risks cross your mind. All those jumps don’t really register as risks, in the new context that Zion creates through the sheer force of his Zion-ness. They are, each of them, more like pre-blocks, or pre-steals; he racks up a combined four of those every night out. He is almost never not in flight, at least in some small way. Train your eyes on Zion Williamson over the course of a whole game and you’ll see that he spends as much of the game as permissible in mid-air, and not just for the exclamation points that lend his highlight reels their delirious element of violence. Even in mundane moments off the ball, on either end of the floor, he covers the floor in tiny anticipatory bunny hops. He’s a coil of potential energy, ready to be unleashed at a whim. He looks like he could not possibly having more fun playing basketball—like even he realizes how lucky he is to be piloting 285 pounds of Zion Williamson around the court. And who wouldn’t be happy about that, if it meant the freedom to do all this?